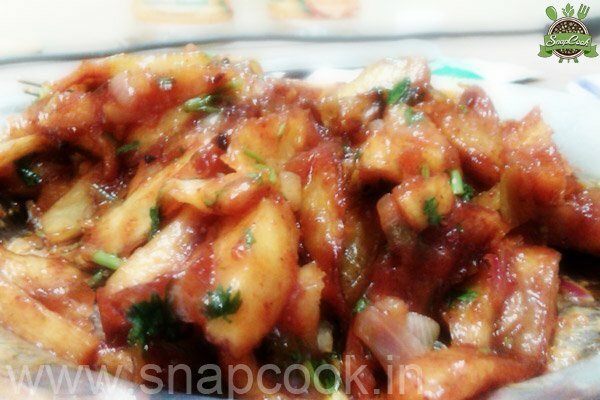 Crisp, hot and yummy any time favourite snacks having counter taste of sweet and chilly made with crisp potato wedges. Nice combination of Western Desi style. Heat sufficient oil in a non-stick pan. Deep fry potato wedges with corn flour (put corn flour and water in bowl to make a paste) till crisp and golden. Drain on an absorbent paper. Heat oil in another non-stick pan. Add ginger garlic paste. Sauté for a minute. Add onions, mix well and sauté till onions are translucent. Now add red chilly sauce (if not, grind tomato sauce with green chillies), red chilli flakes, lemon juice, sugar and honey. Mix well and cook for half minute. Add salt (to taste) and mix well. Lower the heat and add fried potato wedges. Mix well. Make this as close to serving time as possible, as it tastes yummy when hot and crisp. You can use vinegar instead of lemon juice. You can also garnish it with spring onion greens.